It’s important to understand that these distortions are the byproduct of government intervening to raise wages. 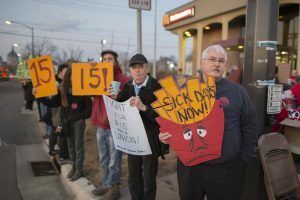 The fact that mandated minimum wages are bad for some workers who will lose their jobs as a result doesn’t mean that all wage increases are bad. In fact, when wages go up naturally as a result of economic growth, improved productivity, and more competition between firms for workers, wage hikes don’t come at the expense of other workers. That’s why we can expect a sustained rise in wages resulting from a decrease in the corporate income tax rate—a tax cut that increases capital investment and productivity, and then wages. How much they will grow over time is an empirical question. Make a law that says no person can make more than 10 times the wage of the lowest paid employee in that company. Hey McDonald career burger flippers and servers…think Kiosks…they are here….robot flippers are next. Guess what ? They will cost less than $15.00 per hour. How ya gonna buy your pot? 1. Work harder 2. Work smarter 3. Hire more workers 4. Add some automation There are several combinations of these that could raise production. Not all are the same, and some may be more effective in some cases than others. It is not a simple thing, but if “management and labor” actually work together… It CAN be done. Maybe, JUST MAYBE, you should consider “NOT” being a single parent, and consider learning a skill or trade, or get an education, BEFORE you start having kids. You know, like responsible adults who have an IQ in the double digit range, rather than all of you helpless libtards who think like monkeys… Why is it that we always use the worst financial situation as the barometer for establishing a minimum wage? Why not do something for yourself so you don’t end up an adult with a pre-teens lack of skills and kids to feed that you cannot afford? Give the kids up for adoption if you are unable to provide for them. If you are a single adult with kids and no job skills, you have failed, PERIOD.